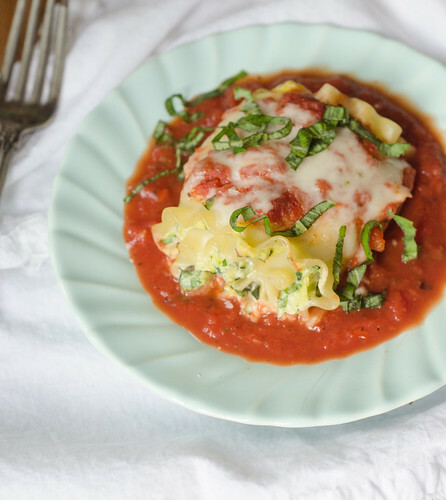 What do you get when you combine one of my favorite comfort foods with fresh summer produce? 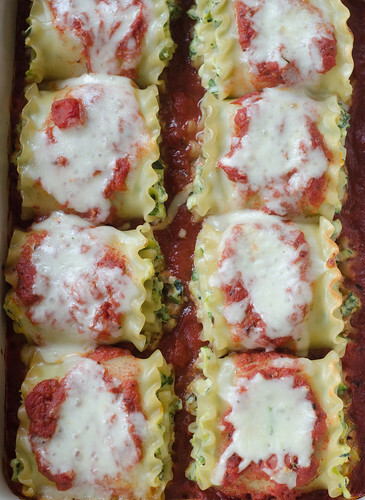 Spinach and Zucchini Lasagna Rolls! These tender pasta rolls are stuffed to the gills with a mixture of ricotta, parmesan, zucchini, onions, and spinach. Then they're smothered in marinara sauce and cheese, baked, and devoured. And my gosh, they are good! And as far as eating a baked pasta dish with three cheeses, they are actually pretty light. A modest amount of cheese goes a long way in lightening these up, and the addition of zucchini and spinach bulks up each serving. I've been making a conscious effort to eat healthier this summer, and it's so refreshing to be able to enjoy a meal like this with no guilt. It still has that satisfying comfort food feel, but thanks to a few steps to lighten it up, it's actually fairly healthy. Definitely the best of both worlds. Heat the oil in a large skillet over medium heat. Add the onion, and cook until just softened, about 3 minutes. Add the zucchini and sauté until it is softened and beginning to brown, 4 to 5 minutes. Stir in the garlic, 1/4 teaspoon of salt, and 1/4 teaspoon of pepper, and cook until fragrant about one minute. In a medium bowl, combine the zucchini, spinach, ricotta cheese, Parmesan cheese, egg, red pepper flakes, oregano, 1/2 teaspoon of salt and pepper in a medium bowl. Lay out the lasagna noodles on a clean work surface. Make sure noodles are dry. Take a scant 1/3 cup of ricotta mixture and spread evenly over the noodle. Carefully roll the noodle and transfer it seam-side down to the prepared baking dish. Repeat with the remaining noodles and filling. Ladle the remaining sauce over the lasagna rolls and top each one with 1 tablespoon of mozzarella cheese. Cover the baking dish with foil, and bake for 30 minutes, then remove the foil and cook an additional 10 minutes. Allow to cool slightly, sprinkle basil over the top, and serve. Mmm such a nice dinner idea! Total comfort food that isn't too bad for you. I dig it! I am definitely bookmarking this. It's hard to find lighter summer fare that's not just grill-grill-grill. Thank you! I had forgotten all about lasagna roll ups. I think they are just plain wonderful. But I just forget about some recipe ideas, because there are sooooo many to choose from. Now I have pinned yours on my pasta board. I will be duly reminded. I love the filling in this version. 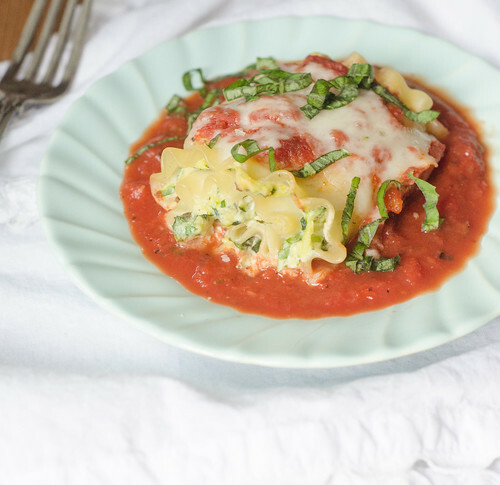 Lasagna roll-ups are such a fun way to feel like you're eating total comfort food, but with built in portion control! I love how veggie-stuffed these are. So summer-ready! Made this over the weekend. It was really good. Easy to make, too. I used cottage cheese since that's what I had on hand. I didn't realize how watery zucchini is so absorbing the liquid is really important. Kids enjoyed it, too. Thanks! Yay, I'm so glad you liked them! Good call on the cottage cheese - I've used it before in a pinch, and it works really well! yes, built-in portion control is key!